Based on [www.thingiverse.com] I built a replacement for the belt on the x-axis of my Prusa. As Triffid Hunter suggested in his comment, I used a small pinion instead of the big one. I observed no backlash. Next I will replace the y-belt. 48 mm/s were no problem. Edited 1 time(s). Last edit at 04/25/2012 03:36PM by theodleif. could a person try switching it to, m4 threaded rod to save on mass or is there another reason that you would want to use that heavy threaded rod still.? Very nice! I had been thinking about a rack and pinion for a little while. If the gear's teeth mesh with the rack well then there should be no backlash - but that will also depend I guess on the geometry of the teeth, moreso when you're going at very high speeds. Unfortunately for me I'm getting in on RepRap a little later, and I'm still waiting on the rest of my parts to arrive before I can make one. One thing that I was thinking about though is durability. I plan to maximize speed, accuracy, and repeatability with my machine, and so if at high speeds I'm wearing down a printed rack or gear really fast, then that would be a problem. Keep us updated! What's the maximum speed you can achieve reliably with your X axis now? > achieve reliably with your X axis now? 100 mm/s. Still improving. The pinion stops much harder than a belt. But I it seems to be very accurate. In rack_herringbone.scad, line 16 you find: innerRadius=3.1;//shaft radius, in mm. Just change the radius to the value you need. Meanwhile I replaced the belt on the y axis too. Now the printer runs without belts. Do you use lubrication on the racks? 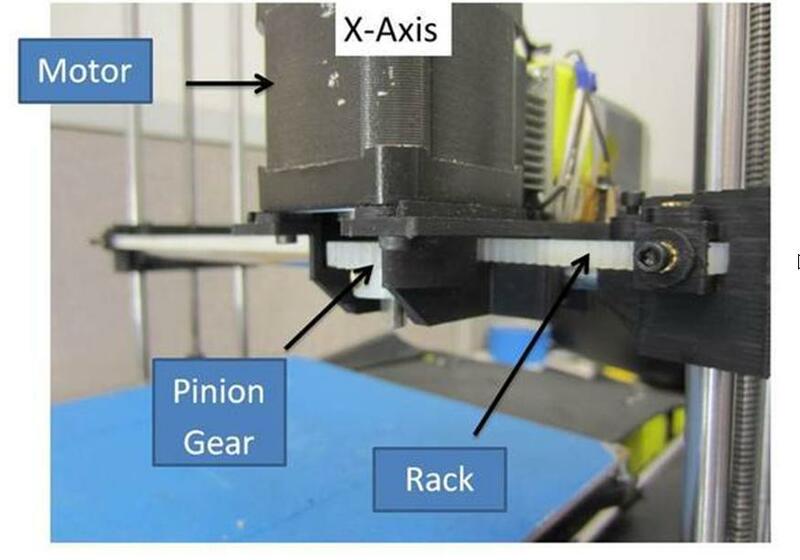 I guess the next step in evolution would be to replace the rack with a rigid chain actuator, so that the footprint of the printer is the same as with belts. Very interesting. Have you needed to lower your acceleration? > Do you use lubrication on the racks? I should, because the printer tries to jump off the table. amazing. as I said on thingiverse I'm very curious to see how this shapes up over extended use but not needing to buy belts is awesome. even if it wears down I'd rather print a new tooth bed than buy belts. for $16 you can print quite a few tooth beds and melt down the old abs into a rubber mold for re-use. I can easily see a different printer design where the motor moves rather than the rack being a much closer basis for a fully printed printer minus electronis. It seems like it would be a fairly simple redesign for the y axis to move the motor to the center and have the rack mounted to the bottom side of your print table. This would eliminate having the rack stick out so far from the rest of the printer. It was setup where you could pull the platform all the way out which was pretty nice for access when removing prints. I can only offer a suggestion based on CNC lathe experience. I once tried to convert a lathe that used a rack and pinion drive. At first it was great, as the teeth wore the back lash became horrible. Hopefully the lack of load on the printer will make wear much less of an issue. Those appear to be square teeth, you should consider using an involute tooth. It will wear more even. Now my Prusa Mendel and my Huxley both run with rod and pinion. Where do you get your springs? I love the rack and pinion idea. I have not rally seen this explored any further yet in the wild. This idea needs to be applied to the Rostock printer. The darn thing will be mostly printed parts at that point. 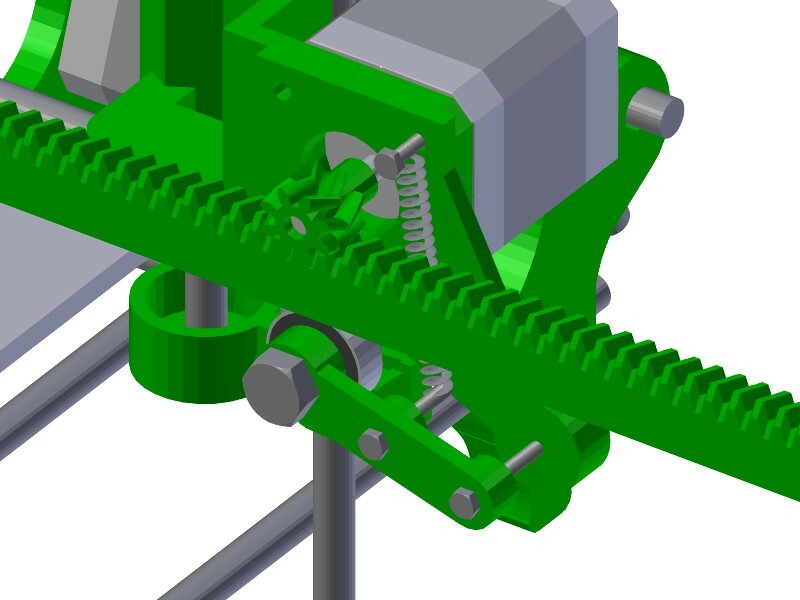 Interesting thread as I found this Kickstarter offering their injection moulded printer using Rack & Pinion for X. @prober: I am not sure, if it is a good idea to carry the x-stepper on the x-carrier. Better keep it light. @idolcrasher: I bought a set of 200 different springs on ebay. wonder why they did that? Do the large machines use this method? They claim this design comes from their experiences with the larger equipement. Prober: Probably to reduce footprint, otherwise you need to attach rack to the x carriage and it will protrude a lot with carriage near stepper position.